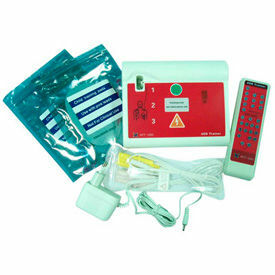 Defibtech Defibrillator Packages And Pads Allow Immediate Response And Treatment Of Sudden Cardiac Arrest Emergencies. Defibtech Defibrillator Packages And Pads are designed for safety and first aid in schools, offices, stores, factories, gyms and other public environments. Defibrillator And Accessory Package includes the Lifeline AED defibrillator with prescription certificate, wall mount cabinet with alarm, 3-way AED wall sign, and a first-aid rescue pack. Defibrillator Package With Prescription Certificate comes with one set of adult defibrillator pads, one set of defibrillator electrodes, 5-year battery, 9V status indicator battery, manual and quick-use card. 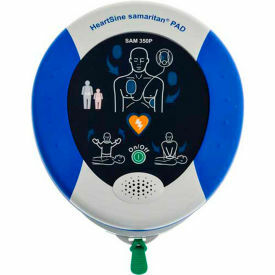 Additional Defibrillator Pads are available in Adult and Pediatric sizes. First Voice™ Generic AED Trainer Device System Features 8 Pre-Programmed Scenarios For Training And Troubleshooting. First Voice™ Generic AED Trainer Device System is durably made for long lasting use and dependability. Replaceable plug-in module can be updated along with ECC guidelines updates without the need to buy an entirely new unit or send out for reprogramming. Provides safety training and troubleshooting options for students. Universal system includes case, remote, and user's guide. ADA compliant. Available in English and Spanish. Color finish is White/Red. Includes 1 Year Warranty. AED Kits Provide First Aid For Commercial, Residential And Industrial Work Sites, Offices Complexes And More. 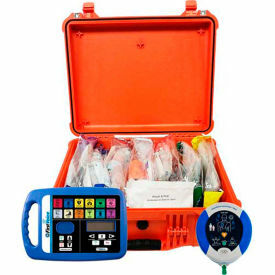 AED Kits provide on-the-spot first aid for a number of treatments. Kit contents include color-coded zipper bags and patented first aid technology, Emergency Instruction Device (EID), viewing pocket and side pockets to keep first aid items visible and accessible. Styles include Backpack First Aid Responder Kit w/AED, Jump Bag First Aid Responder Kit w/AED and Rugged case First Aid Responder Kit w/AED. Case material is Nylon or Plastic. Available in 100-person or 400-person kits.